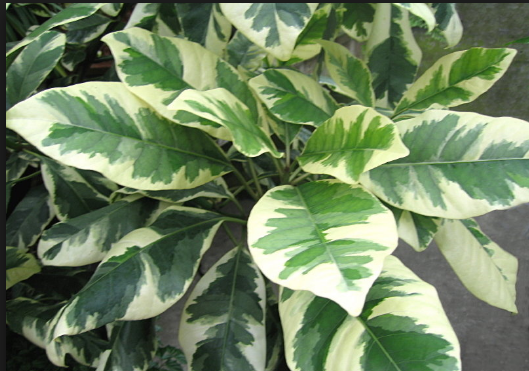 Although the plain form of Pisonia, also known as para-para, grows into a tree in the wild, this attractive form with variegated foliage makes a good houseplant. 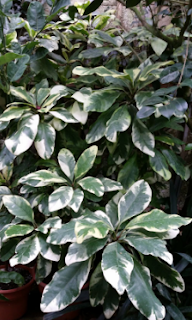 The 16-in/40-cm-long leaves, marbled with pale green, have cream-colored margins that are faintly pink when young. In the cultivated form, small pink or yellow flowers bloom in clusters. ORIGIN: Australia; New Zealand; Mauritius. HEIGHT To 10ft/3m in a container. REPOTTING: Repot young plants in late winter or spring; top-dress older plants. PROPAGATION: Take stem cuttings, or air-layer, in summer. KEEPING PLANTS: The plant may quickly outgrow its space, but it can be pruned to maintain size and shape when it is repotted. Set the plant outdoors in summer in mild climates. Full sun or partial shade; the plant loses its color if the light is not bright enough. Warm room or greenhouse conditions, with a winter minimum of 50°F/10°C. Water moderately when in growth, sparingly in winter.